During a rigorous three week tour of Europe guitarist-composer Bruce Arnold took a breather in the beautiful city of Bruges, to visit with Gilbert Isbin, also a composer and guitarist. The two had initiated an online correspondence, exchanging music and ideas for a year, and when the opportunity arose for Arnold to perform in Belgium, it also became an opportunity to collaborate on a recording. 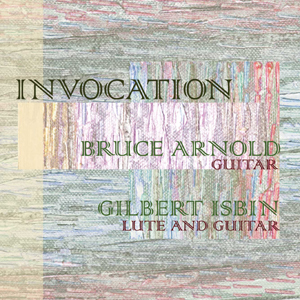 The result is “Invocation,” a series of evocative acoustic excursions. Both musicians brought their original compositions to the effort. With its strong modal structure, the title track “Invocation” shows Isbin’s lyrical side, while “Knomish” reveals a more angular, rhythmic approach. Arnold supplied “A Day in the Badlands” a 12 tone structured tune with a spacious melody and a minimalist palette. Known more for his electric guitar playing, here he is heard playing classical guitar, with a deep tone and precise touch. Both players worked together to create a sound that is seductive to the ear. The free improvisational pieces, with their contrapuntal passages and inherent lyricism reflect the strong sense of structure that each musician possesses. To hear or purchase music from this CD please visit the Invocation page at the record company Muse Eek Recordings.